Scanning electron micrograph o S. aureus; false color addit. 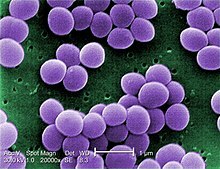 Staphylococcus aureus is a Gram-positive coccal bacterium that is a member o the Firmicutes, an is frequently foond in the human respiratory tract an on the skin. This page wis last eeditit on 11 Januar 2015, at 18:53.